The Kettler Classic 10 is their flagship model. Its 22mm top provides excellent play quality with a great bounce. The folding system is Kettler's best yet; there's just one catch per half and it takes literally 5 seconds to raise or lower each top. It has a neat and compact folding system and is slightly narrower than some brands making it easier to manoeuvre (especially through doorways etc). The wheels are slightly rubberised which makes it run smoothly on all surfaces. There are also lots of gadgets too....a large ball dispenser under each table top, safety corners, leg levellers and a clever elasticated storage system by the net post (for bats, water bottles etc). The net & post set is part of the standard package from Kettler. Some retailers claim they themselves are giving this as a 'free of charge' extra; they even include it as part of the value of the free accessories! Unlike most suppliers who offer two, very basic bats with their tables, at Table-Tennis-Tables.co.uk we're giving FOUR Knight Lionheart 3 Star and 12 table tennis balls, absolutely free! 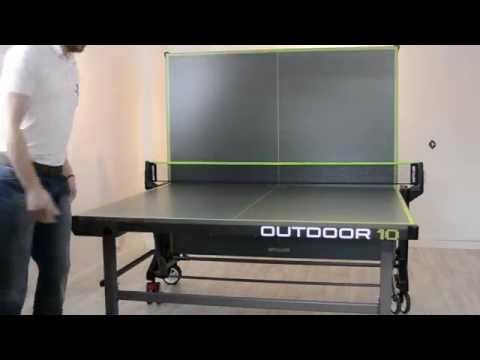 Yet another great reason to choose Table-Tennis-Tables.co.uk.